Civilization VI Review - My 2016 Game Of The Year — GamingWithSwag.com - Dads By Day, Gamers By Night. High Level Premise: Just like other Civilization games, you start from having a settler and warrior to build an empire while dealing with the diplomacy involving neighboring nations and city-states. Be the first to become the most powerful nation in the world. Graphics/Style: Civ VI gets away from the realistic style of the 5th entry in the series, and heads in a direction of cel-shading and cartoon-like characters. It's refreshing to see a change that's not too drastic for the series. Music/Soundtrack: The one thing I love about Civ games is the soundtrack. This one is no exception, it is so peaceful ruling the land. I also really like the music that plays when you create a wonder, it feels so epic. Narrated by Sean Bean, what a perfect choice! Story: C'mon. It's Civ! No story to worry about here, just conquer your opponents! Replay-ability: Huge. 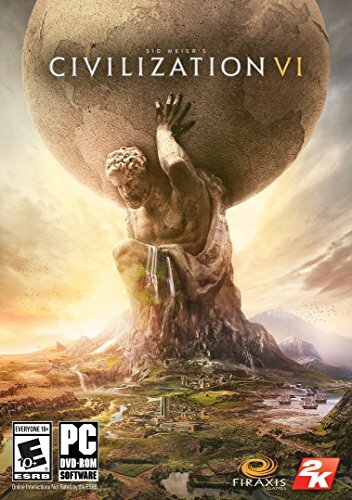 If you are a Civilization fan like me, you are going to be playing this one for years. Time Commitment: Just like prior Civ games, a campaign most likely is going to take you several hours to complete, even longer on the higher difficulties where decision making is critically important. Value: $59.99 is the retail price for this one, it's been on sale a couple of times since release. Still, if you are a Civilization fan, you are still going to get tons of mileage out of the full price. Favorite Element: The ability to stack units is a huge improvement over Civ V. I really like the district system as well, it brings a whole new level of strategy to the game. The lands can be expansive if you choose the larger map settings. I received a key from our friends at Aspyr back in late October. After installing it on my 2013 MacBook Pro, it turned out that it would run, but would really slow down after you started to have multiple units on the screen. After round 25, I finally gave up and unfortunately had to put Civilization VI to the side until I could upgrade. Finally, after receiving a brand new machine, I am happy to give Civilization VI the proper review it deserves. What can I say? Civ is life. I'm not going to go into explaining what Civilization VI is, as people know it is likely the most popular real turn strategy game series of all time. If you are new to the series, I suggest you watch the trailers of the game and read up a little bit about the series before diving in. Veterans know that Civilization is a time sucker, as it becomes addicting very quickly. "Just let me finish this improvement", or "wipe out these barbarians", and even the famous "just one more turn" are all spoken in my head when trying to quit a Civilization VI session. I would consider myself to be a very advanced Civilization player at this point, as I have been playing this series since the 1990's. Fun fact I have almost 400 hours poured into Civ V and the corresponding expansions. The district improvement system is a welcomed addition to the game, as it fosters additional strategy needed for developing your city. Each district type provides a bonus, and where you physically place that district matters a whole lot depending on your perks and bonuses for your Civilization and your Pantheon / Religion. I can't express how much this angle means to success of your Civilization, playing to the district bonuses can mean the differences between quick defeat and ruling the world. Building wonders in Civilization Vi feels like an epic achievement, which it is! The A.I. diplomacy is the only real gripe I have with the game. It doesn't take a lot to piss off other Civilization leaders. Maybe you moved your scout unit to the wrong tile, or befriended the wrong city-state. Either way, I feel like they are always willing to denounce you at the drop of a hat, even though you may have made them a sweet deal a few turns ago. A missing feature from Civ V is Multiplayer "Pit Boss" mode which is something that me and my friends played on the regular. To be fair, Pitboss mode was not available at launch for Civ V, but it's hard to go back to being without it. That being said, there are always the possibilities for patching these two issues in at a later date. Combat is great, I love the fact you can combine similar units to form corps or armies to maximize the strength of that unit on a tile. The policy system is also a new favorite of mine, I love the fact that I can switch out policies easily when discovering new Civics, and switch out governments that provide additional bonuses. The wildcard policy slots are amazingly useful, because depending on what you are doing that particular turn you can improve things like production, religion, gold, combat, and other perks. The soundtrack is peaceful and relaxing, and the narration by Sean Bean is a delight. Never bring a bow to a pike fight! Overall, Civilization VI is a great entry in the long running strategy series. It has a few flaws, but nothing that makes the game unplayable. I can successfully crown Civilization VI as my personal 2016 Game of the Year for addicting me once more to building and destroying other civilizations. If you have never played a Civilization game before and like strategy games you owe it to yourself to check this out. I am very excited to check out the Poland Civilization and Vikings Scenario DLC expansions. I hope to have these up for you soon in a future review. For now, I should be doing something productive like working on my house, paying bills, or something. Maybe in a bit, after just one more turn. Take one more turn with Civilization VI, available now on PC and Mac. Build. Conquer. Inspire. SUBSCRIBE for First Looks and tips from the developers of Civilization VI - http://2kgam.es/CivilizationYT Music: Sogno di Volare - Christopher Tin Winner of 15 awards at E3 2016 including "Best Strategy Game" and "Best PC Game."